Many accountants falsely believe that there’s only one standard that deals with long-term tangible assets: IAS 16 Property, Plant and Equipment. While it’s true that you need to apply IAS 16 for most of your long-term tangible assets, it’s not the one ruling all. I tried to falsify this myth some time ago here. Except for IAS 16, we have a few other standards arranging the long term assets. IAS 40 Investment Property is one of them. The video is waiting for you in the end. Before we dive in IAS 40, my good friend Professor Robin Joyce wrote a wonderful piece that teaches you accounting for IAS 40 in 40 seconds. Hope you’ll enjoy! there is no depreciation if revaluations are carried out every year. 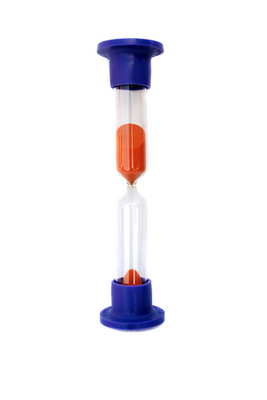 Any remaining seconds should be spent on learning the classifications and rules of IAS 40 Investment Property. Now, let’s take Robin’s advice and spend the remaining seconds for learning the rest. IAS 40 Investment Property prescribes the accounting treatment and disclosure with respect to investment property. But, what is investment property? For sale in ordinary course of business. If you’re using your building or land for the first 2 purposes, then you should apply IAS 16; and the standard IAS 2 Inventories fits when you use them for the sale in ordinary course of business. What specifically can be classified as investment property? Land held as an investment for long-term capital appreciation, or for future undetermined use (i.e. you don’t know yet what you’ll use it for). However, if you buy a land and you intend to build some production hall for your own purposes sometime in the future, then this land is NOT an investment property. A building owned by the entity and leased out under one or more operating leases. This includes a building that is still vacant, but you plan to lease it out. Any property that you actually construct or develop for future use as investment property. Be careful here again, because when you construct a building for some third party, this is NOT an investment property, but you should apply IAS 11 Construction contracts, or IFRS 15 Revenue from Contracts with Customers. Investment property shall be initially measured at cost, including the transaction cost. Any directly attributable expenditure, such as legal fees or professional fees, property taxes, etc. However, if these start-up expenses are directly attributable to the item of investment property, then you can include them. But do NOT include any general start-up expenses. Abnormal waste of material, labor or other resources incurred at construction. When payment for investment property is deferred, then you need to discount it to its present value in order to set the cash price equivalent. Let me just mention that actually, you can classify assets held under finance lease as investment property and in this case, it’s initial cost is calculated in line with IAS 17. 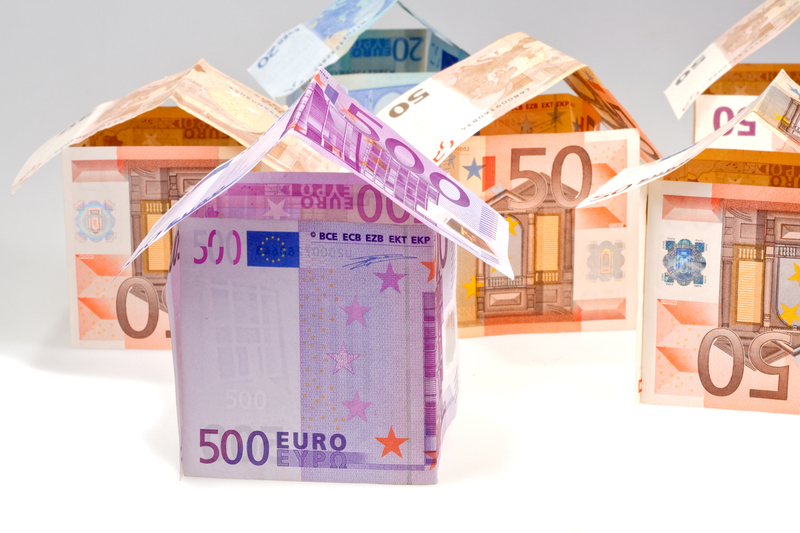 After initial recognition, you have 2 choices for measuring your investment property (IAS 40.30 and following). Once you make your choice, you should stick to it and measure all of your investment property using the same model (there are actually exceptions from that rule). The fair value is determined in line with the standard IFRS 13 Fair Value Measurement. A gain or loss from re-measurement to fair value shall be recognized in profit or loss. To measure your investment property using cost model, if it’s completed. The second choice for subsequent measurement of investment property is a cost model. Here, IAS 40 does not describe it in details, but refers to the standard IAS 16 Property, Plant and Equipment. It means you need to take the same methodology as in IAS 16. Can you actually switch from cost model to fair value model or vice versa from fair value model to cost model? The answer is YES, but only if the change results in the financial statements providing better, more reliable information about company’s financial position, results and other events. Switching from cost model to fair value model would probably meet the condition and therefore, you can do it whenever you’re sure that you’ll be able to determine the fair value regularly and the fair value model fits better. However, the opposite change – switch from fair value model to cost model – is highly unlikely to result in more reliable presentation. Therefore, you should not really do it, and if – rarely and for good reasons. When we speak about transfers related to investment property, we mean the change of classification, for example, you classify a building previously held as property, plant and equipment under IAS 16 to investment property under IAS 40. You held a land for undefined purpose and recently, you decided to construct an apartment house to sell apartments when they are built (transfer from investment property to inventories). What’s the accounting treatment in this case? It depends on the type of a transfer and the accounting choice for your investment property. If you opted to account for your investment property at cost model, then there’s no problem with the transfers, you simply continue with what you did. When you transfer to investment property, then the deemed cost is a fair value at the date of transfer. Difference between asset’s carrying amount and its fair value is treated in the same way as revaluations under IAS 16. When you transfer from investment property, then the deemed cost is also fair value at the date of transfer. The derecognition rules (=when you can remove your investment property from your books) in IAS 40 are similar to the rules in IAS 16. When the investment property is permanently withdrawn from use and no future economic benefits are expected. Gain or loss on disposal is recognized in profit or loss. 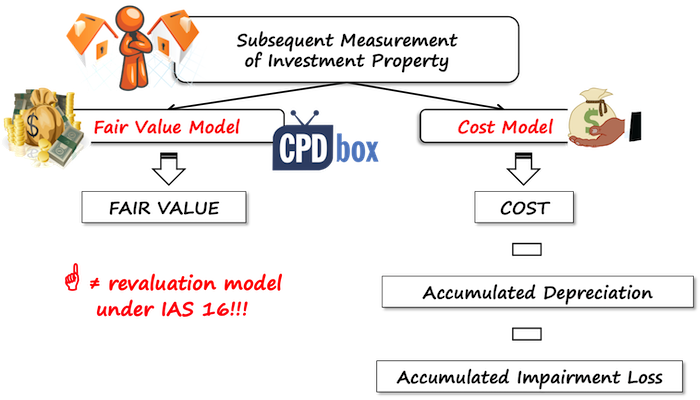 IAS 40 Investment property prescribes a lot of disclosures to be presented in the financial statements, including the description of selected model, how the fair value was derived, what the classification criteria for investment property are, movements in investment property during the reporting period (please refer to IAS 40.74 and following for more information). This is an excellent summary of the standard. Much appreciated. Thank you. Siliva M. This is an excellent Summary of Standard. Keep it up. We hava a building where we occupy part and also rent part. How do we account for the building? in this case, a part of a building that is owner-occupied is treated under IAS 16, and a part that is rented is treated under IAS 40. S.
it requires your judgment and some calculation. Let’s say you have a building with 40 offices. You use 10 offices for your own admin purposes and you rent out 30 offices. You bought the building at its fair value for CU 100. In this case, 10/40, or 1/4 will be treated as owner-occupied property under IAS 16 (i.e. 100/4 = 25, you will depreciate it or apply revaluation model). The remaining 30/40 or 3/4 will be treated as investment property (75 – revalue to fair value each year, or cost model). S.
Really helpful article. I have a practical issue with my Company. The parent company has rented one of the building to its subsidiary ever since constructed and is likely to continue it forever. Both parent and subsidiary are in same line of the business. So, will in the separate financial statement, parent will classify that building as “Investment Property” and “Property Plant and Equipment” in consolidated financial statement. Looks odd at first instance but logical at same time. thank you for the comment. Yes, it might look odd – but, it’s not unusual 🙂 S.
Excellent and easy to follow. Thanks! 1. A Vehicle rental company : How will it recognize its motor vehicles?? will it still apply IAS 16?? 2. An equipment trading Co. : Which has some motor vehicles used for its own administration purposes, while a couple of vehicles it rents out to some external customers to earn some extra income. Could you please assist me in understanding as to how this companies recognize the Motor vehicles in line with IFRS??? Hi Mohammed, both vehicles need to be recognized under IAS 16. Please remember that IAS 40 applies only to lands or buildings. S.
Under both standards, IAS 40 and IAS 16 can include properties that are rented out right. So how will we distinguish . If the rental property form part of the primary operation of the business ( say car rental co) then it will accounted under IAS16. If the rental property is ( land or building) held to earn rental but does not form part of primary operation , we can account under IAS 40. Kindly let me know whether my understanding is right. I would not say so. As soon as you earn rentals from the buildings/lands, then it’s automatically classified as investment property, no matter your principal activities. S.
– ‘for rental to others’ mentioned in IAS 16 definition of PPE will become applicable? can you give an example.? Is the renal part mentioning in IAS16 only for properties other than land and building? Practically it is any PPE, except for land and buildings, because they are specifically listed in IAS 40. Examples: vehicles, machines, furniture… S.
I really admire your way of teaching and presentation. Excellent piece as usual please keep it up. Can a hotel which is owned by the company be classified as an investment property ? And if yes according to what basis? it depends on what services hotel provides to its occupants. Normally, these “ancillary” services are quite significant, and therefore, a hotel should be classified as owner-occupied property (IAS 16), not investment property (IAS 40). S.
Thanks for making time to explain IFRS in its simplest way and treatment. You are doing a good job. Such a great explanation Silvia!! you are awesome! Really an amazing job, and than you for what you are doing!! If cost model is applied, there is a requirement to disclose its fair value. Should this fair value be the fair value as at reporting date? Or can I disclose it using last year fair value? Silvia, It will be really great if you also mention the exact reference in the SLFRS. Many people fail to go through the standards, they just rely on what others say. If you state the reference along with your explanation, it will be great for us to refer in case if we require more detail explanation. Excellent presentation. Thank you for your efforts. If there is a switch from cost model to fair value model, could you please advise how to deal with the fair value gain or loss? All to profit or loss in the current year? Or this is a change in accounting policies and retrospective adjustment needs to be made? And investment property and retained earnings have to be restated? 2: subsequently, when the cash received than credited the insurance co.
What about Prepaid Insurance Expenses???? and above covered the whole accounting for Insured Assets??? Thanks Silvia for the insight. Please how do you treat and disclose selling costs of an investment property on the financial statement. As part of our property financing arrangements, we are required to register a bond over the property, which serves as security for the financier. The registration of such a bond is performed by an attorney and significant fees are charged to do so. How would you treat these costs? Would they be considered as other transaction costs at initial recognition and form part of the cost of the property? Or are these regarded as a cost of financing, which should be expenses in profit or loss? Riaan, these are the financing costs. And, I don’t know the details of the arrangement, but if you keep your bond at amortized cost, then these transaction costs are not expensed in P/L immediately, but they are treated as a part of amortized cost/effective interest method. S.
Hello Silvia,why these costs are treated as finance costs,is that they are legal coasts therefore should be included in the purchase price? Hi Njabulo, I understood that these costs were incurred to gain some cash to finance acquisition of an asset, not to bring the asset to the planned location and condition. S.
What is the definition of building? is quayside of port or parking lot (rented to third party) can be clasified as building? IFRS do not define “building”. This is more an issue for tax rules. But definitely, parking lots meet the definition of PPE under IAS 16 🙂 S.
Hi, Silvia. Thank you for your insights. But I have a query. The standard says that if the the property is partly Investment Property and PPE and it cannot be sold or leased (finance) out separately, it would be classified as Investment Property only if the PPE portion is insignificant. What if both portions are significant but cannot be sold or leased out separately, how should it be accounted? Thanks, Silvia. In this case, that would be accounted for under IAS 16, i.e. as PPE. hi, the answer is in your question. “…it would be classified as Investment Property only if the PPE portion is insignificant.” so if both portions are significant you cannot classify the asset as Investment Property therefore it is PPE. If a property was used by the entity it would be classed under IAS 16. Lets say this value was 1000 less dep of 400 giving a NBV of 600. The entity now decides that it should be investment property and so its valued at fair value of $1,100. The difference of $500 should be recorded in the OCI-revaluation reserve? yes, ecactly as you wrote. S.
I have one question where I did not find an answer neither in the standard nor in interpretation. What is if a property (vacant) has been acquired with the intention to let it after a re-development phase of approx. 2.5 years. At inception the property has to be classified under IAS 40 as IP (held at cost as FV was not reliably measurable). However, in year two an offer to sell the property is accepted and a pre-sale contract is signed. Would this trigger a reclassification from IP to inventories (IFRS 5 is not relevant as the property is not available for immediate sale in its current condition)? Many thanks in advance for your assessment. yes, I think you get it right. The original purpose of holding your property was to let it after development phase, but now your intention is to sell it after some development is completed – it’s in inventories then. S.
Again I have concern as our company is in the process of converging from Local GAAP to IFRS. our company activities includes constructing of Villas, Apartments on owned or leased lands, then rent them for periods ranging from 1-3 years contracts. Your usually response is needed. that would be a typical IAS 40 Investment property. S.
I have a very specific question.I would apprceiate a lot if you could answer. According to IAS 40, paragraph 61, during transfer from PPE to investment property that will be carried at fair value, we treated any difference between CV and Fv of property in accordance with IAS 16. So,for example, at the transfer, we had CV 10 and FV 12. The difference 2 was recognised as revaluation reserve. But how should we treat it in subsequent years? Say, we now have CV 12 and FV 9. Can that negative revaluation of 3 be split into: 2 – decrease of revaluation reserve, recognised in previous period and 1 directly recognised as a loss from revaluation in Income statement, i.e. consistent with IAS 16? Because, otherwise, if we recognise all revaluation loss of 3 in IS in accordance with IAS 40 fair value model, we leave revaluation reserves of 2 untouched, while significantly lowering our net result in IS. I think you are right in your last paragraph. IAS 40 in par. 62 mentions that in this case, the revaluation surplus is transferred to retained earnings on subsequent disposal only. It implies that until you dispose the asset, you normally follow fair value model and book all fair value changes in profit or loss. In my opinion, this is fair, because if you would have purchased the same asset for its fair value of 12 (no revaluation surplus), under fair value model, you would have to do the same thing. S.
Greetings from Kazakhstan & Merry Christamas! I have a query: If a bank held a prperty from defaulted customer with intention to sell it in order to collect the amount of defaulted debt, what is the applicable IFRS for accounting for this property? Is it IAS 16, IAS 40 or IFRS 5? Normally, if all conditions are met (and it’s probable they would be met), the bank can classify the property as non-current asset held for sale, otherwise under IAS 40 (as the property would not be owner-occupied). Please read more about the classification as held for sale here. S.
if there is a transfer from IAS2 to IAS40 will this be made at cost provided that i elect the cost model under IAS40? Also, if i have a property under IAS2 and then i use it for own purposes IAS16, the transfer from IAS2 to IAS16 will be made again at cost? What if our main business is to earn rentals is the building should be classified as fix asset or IP. ? the purpose also covers Rental and In Investment property also covering rentals..
Could you Please tell us how to differentiate. A hotel which only provides rooms to stay, rooms will be treated as inventory or PPE or Investment property? Thanks for the write up, its informative. i have a question on transfer from owner occupied property to investment property. If i am currently following revaluation model under IAS 16 for the owner occupied property whereas for investment property I am following cost model, on the date of transfer at what value should i recognize the property under IAS 40? this is a very odd – measuring PPE using revaluation model (i.e. fair values) and investment property using cost model. It’s not against the standards, however, I’m not sure if it really ensures the true and fair view. Just my opinion. Nevertheless, this situation is not solved in IAS 40, however, I would apply the analogical method as the one when you transfer the asset from investment property at fair value to PPE. You should simply take the fair value at the date of change as the cost of an asset. S.
I have following practical question. Can you please look into and respond? A company changes from cost to fair value mode. On 1 Jan 2016 the carrying amount of the property is CUR 750 and the fair value of the property is CUR 1000. During the year end 31 Dec 2016 company capitalizes further additions of CUR 400 and borrowing costs CUR 100. Now the carrying cost as on 31 Dec 2016 is CUR 1250. The fair value of the property at 31 Dec 2016 is CUR 1400. What will be gain to be recognized in income statement CUR 650 (1400 – 750) or CUR 150 [1400 – 1250 (750 + 400 + 100)]? If answer is CUR 650 then whether additions during the year (400 + 100) will be capitalized or will there be a different treatment? Further, has fair value as on 01 Jan 2016 (CUR 1000) any relevance? till last year the Investment property and the financial instruments are reported at cost model. Now the company has decided to use fair value model. The company has engaged consultant to value the investment property and the financial instrument such as Bond and Equity at fair value. The difference between carrying value and the fair value is so huge. also, the company is yet to adopt full IAS and IFRS, and intends to adopt full IAS and IFRS by June 2017. Under such case, how should I treat the fair value gains for Investment property and Financial instruments. Can I consider this initial fair value gains (Fair value-carrying amount) as revaluation reserve. the subsequent gains/loss will be routed through P/L. i dont know what is the difference between transfer TO and transfer FROM investment property… should we record the depreciation in the year of transfer from investment property to fixed asset ? In case we chose to keep the investment property at fair value, how often should we revalue them? Do we have to do it yearly? If not, how do we prove that the value of the investment property did not change from one year to another? for investment property under IAS 40 – yes, you do need to account for the change in fair value on a yearly basis. S.
the develolment/building costs -interest has also been capitalised to the cost of the property. a company owns a land held for rental to sellers on open city market (fruits, vegetables, fish). No contract is signed, the sellers pay a certain amount to the company for the “place” they can put their stand. How to account for this land? It is not covered. IAS 40? a company bought a land and measure it at fair value as investment property,after years, the company decided to erect a building on the land to be used also as investment property. Now the fair value of the new investment property( both land and building) is not reliably measurable and the company will apply IAS 40, para 53 to record building under construction at cost until construction complete. The Dilemma is how to account for land element, which will cease to be separate element anymore. should we record it at its initial cost? continue recording at fv separately from the building, use current fv as cost basis during construction? or other treatment? Could you kindly give me the details of bibliography for this page? If a property has been recognized as an Investment property mistakenly & this should have been a PPE. A revaluation was also recognized. Could you please help me rectify this !!!!! I have to get this sorted at the earliest. if this was a mistake or an error, just correct it as an error in line with IAS 8. If it is material, then correct the previous periods, too. If it’s not material, just correct the error in the current period. You can read more here. S.
My question” If a property transferred from IAS 16 to IAS40, and you picked up a fair value model then as per the standard firstly, we need to revalue the assets under IAS16, so what would be the treatment of that revaluation reserve and when this revaluation reserve move into retained earnings?As per IAS 16 we can transfer the revaluation reserve into retained earning at the time of disposal of asset.But here we are not disposing the assets and we only reclassifying the asset.Could you please suggest? Hi Deepak,you leave the revaluation reserve as it is and you would reclassify it to retained earnings upon subsequent disposal of investment property (not through profit or loss). Please see par. 62 b (ii) of IAS 40. Dear Silvia, Thanks a lot! This is really very helpful..
Is there a choice between IAS 16 and IAS 40 for accounting treatment of building held for rent purposes? Further as per scope of IAS 16, the standard shall be applied in accounting for PPE except when another Standard requires or permits a different accounting treatment. Does it mean IAS 40 should be applied? If you use the building to earn rentals, then you have to apply IAS 40 (cost or fair value model). S.
One of my client is leasing out a parcel of land to a foreign company and this foreign company constructed a building for manufacturing operations. then this foreign company rented to my client the office unit (part of the building constructed). In the book of my client the land is recognized as investment property measured at cost. my concern is do we need to separate the value of the land since part of it is rented to foreign company and part of it is leased back to my client? If I have a building that I rent to customers usually, but at a specific moment I suspended the rent, and the customers left the building because of painting and decororating. From the period of suspension I must transfer the carrying amount from IAS 40 to IAS 16 PPE???? If I have land and building classified as Investment Property under IAS 40 using cost model. Now we want to change the accounting policy from cost to fair value model. I have a question, whether should company calculate depreciation for revalued investment property or not. If you apply the fair value model, then no. If building is given on rent then whether it will be classified under IAS 40 or IAS 16 . As the defination of prorperty,plant and equipment under IAS 16 and defination of investment property under IAS 40 both covers building given on rentals. what should be the process of recording land that are purchased for constructing plot ( business- real estate) ? it depends if you construct it for your own use or for your client within your operating cycle. S.
Hi Silvia 😉 Would the transfers to and from investment property also be a change under IAS8? Or would it simply be a transfer of use? Hi Sanam, it’s not the change in accounting policy. It is simply the transfer triggered by the change in use of the asset (not your accounting policy or estimates). S.
Hi Silvia 🙂 Really appreciates your efforts..Can u please elaborate a little bit about subsequent treatment of “revaluation surplus” arising on transfer from IAS-16 (Cost Modal) to IAS-40(Fair Value Modal).. How such surplus shall be dealt with subsequently??? i.e can a subsequent fair value decrease be adjusted against such surplus??? Upon disposal of an investment property say for $100 and closing costs of $5, do we journal $100 and take $ 5 to P&L or because the closing net receipt is $95 cash, that is the amount to journal. I have been faced with a transaction recently where the net amt was taken to the books, hence the query. I thought i should be able to see a journal with the contract price. Many thanks. The earlier version of IAS 40, paragraph 38 provided that “The fair value of investment property shall reflect market conditions at the end of the reporting period”. This is to say that the investment property shall me remeasured at end of each reporting period, and the difference be taken up in the profit and loss account. It is noted that the current IAS 40 had removed paragraph 38. Does it mean that a company do not need to remeasure the fair value of investment property at the end of each financial year? If so, can a company choose to adopt a policy of remeasurement (e.g. every 3 years) and ignore fluctuations in fair values between remeasurement periods? IP accounting policy is cost model, my understanding is that it means you will have to account for for it as per ISA16 PPE. does this mean i can reevaluate the IP and recognize any revaluation as revaluation surplus, because ISA 16 does gives that option to reevaluate PPE. Not at all. For investment property, you have the option to apply cost model as per IAS 16, not the full IAS 16 – so no revaluation model. S.
I work for a company (ABC Inc.) that owns a lot a buildings, it bought those buildings through the time (many year ago). ABC applies IAS 40 Investment Property for tha accounting treatmen, due to the fact that these buildings and lands are hold for earning rentals and for capital appreciation. Subsequent measurement is made using fair value model. This year signed a lease agreement with other entity, in the following terms: 25 years duration, fix payments are slightly below rental market, there are not purchase option, there are not residual value guarantees.penalties for terminating are 2 moths of rent. (not much). Does ABC company acount its lands and buildings in line with IAS 40 or IFRS 16? Hi Silvia, is property acquired by an entity(financial institution) in settlement of loans through foreclosure be coincided as investment property? what is the proper classification of such asset? Hi Bereket, it depends on what the financial institution wants to do with the property. In most cases, the banks simply sell the property to get cash and thus it is classified as held for sale under IFRS 5. In some cases banks decide to keep the property and earn rentals – then it’s investment property under IAS 40, but it’s not very typical. Hi Hc, if you hold your investment property at fair value model under IAS 40, then IFRS 5 does not apply – you continue to apply IAS 40. If your investment property is at cost model, then you apply IFRS 5. My company owns a number of undeveloped plots of land recognised as Investment property (IAS40). We recently constructed wall fences around them. The question is how to treat the cost of the wall fences. Should we recognised them as a separate Non-current asset category (e.g Land Improvements), add the costs to the value of the land, or expense them? If you are a lessee and you are using the office for your admin purposes – NO. one real estate company bought a plot of land in 2016 and build a condo for sale. The condo will complete in 2018 and hand over to the buyer. Do the land and condo account for Inventory under IAS 2 for initial recognition? Yes, if it is for the resale right at the inception. S.
Thank you so much for such a great summary. But I still have one confusion and would really appreciate if you can take some time from your busy schedule to answer this…. I and still unable to understand that whether all the fixed assets in a building ( e.g. A furnished apartment which includes furniture and fixtures etc) which is classified under ias 40 should be depreciated or not, as these fixed assests will have wear and tear with the passage of time and have a limited useful life, unlike building itself. So should all these be part of ias 40 or should these be treated separately under ias 16 and charge depreciation.